Join the discussion on our forums! Come discuss Patches the Pirate over in our dedicated Patches the Pirate discussion topic. Charge. After you play a Pirate, summon this minion from your deck. What do sailors yell when Patches steals their treasure chest full of laws and other things being transported to parliament for a vote? "The Eyes have it!" Exactly. Although I hated this card, his entrance sound was perfect. Now it sounds trash. Edit: Just found out that patches is more useful after nerfs. You can put this on every odd-aggro decks. He just makes your deck made of 29 cards and summons as a pirate wisp when you play a pirate like Buccaneer [/card]and [card]Swashburglar. This card was OP with charge because its effect and pre-nerf body (with Charge) makes him 2-cost minion. Summon this from your deck when you play a Pirate => Recruit a 0-cost minion when you play a Pirate => 1-cost value. You are recruiting a Wisp from your deck to prevent it from "drawn" situtation and summon a 1/1 body with Pirate Race. 1/1 Body => 0-cost but when combined or sticked to a card, you need to increase that card's cost by 1 Mana. This effects already does Patches a good minion. Charge => Slow down here buddy. This makes the cancer happens. This costs 1 Mana too, according to 1/1 body. Example: Stonetusk Boar. With all of this effects, Patches is worth 2 Mana. And this minion still costs (1). Without Charge. Use it. The reason they nerfed him is because they didn't want him to be like that in wild. Patches is finally a fair card i guess. Its still a free 1/1 Pirat draw from your deck. That effect is still good and should be enough for an 1mana Legendary. Its just not broken and played in almost all decks anymore. 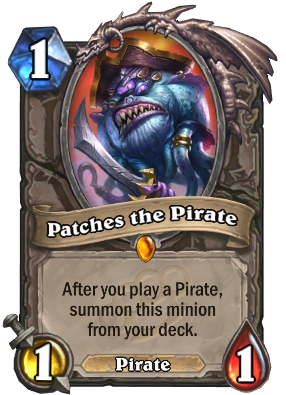 Tho Pirates are not a thing at the moment, Patches is still played in some decks that like to draw cards and play Pirates. Although those are not many now. Could come back when Pirates get new cards, but for now it looks like the big Pirat Era is over. Oh my God, they killed Patches! Blizzard totally killed this card. They could have just let it rotate out of Standard. Now, it is a legendary worth less than common Swashburglar. they said they didn't want Patches to remain this way forever. Thats why they nerfed him. This is the first (and only) card I disenchanted from a nerf since I've been playing the game (since closed beta! ).